Last week, Peters & Associates teamed up with Mesh Systems to deliver a thought-provoking presentation on the reality and availability of business-driven IoT applications. Rachael Narel, from Peters & Associates, started off the day by giving us an overview of the Azure IoT suite and Power BI. After a break for lunch and networking, John Rouse from Mesh Systems discussed the potential and accessibility of IoT solutions by providing concrete examples of successful implementations Mesh Systems has led. Like the advent of cloud computing, IoT applications can still seem futuristic and complicated for many businesses. But it doesn’t need to be. To help demystify the complexity of developing IoT solutions, Mesh Systems provided us with an overview of their extensive and flexible platform for developing IoT solutions, which is built around Microsoft’s Azure cloud. To help further clarify the broad possibilities of their platform, they described various solutions they have implemented. Below are some of my favorite examples. Mesh Systems worked in a partnership with Anheuser-Busch InBev to kick off a new interactive marketing initiative to increase brand affinity in bars and restaurants across the country tied around professional sports. 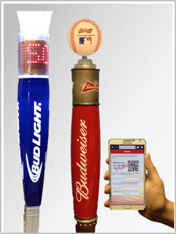 The solution included a custom interactive beer tap handle with neon lights that flash and display dynamic messages every time the home team hits pay dirt in the end zone or crosses home plate. As the project continued, they realized additional benefits; such as real-time beverage consumption during specific sporting events and the ability to alert the appropriate personal when the beer keg is empty, preventing lost revenue from out-of-stock inventory. In partnership with BUNN, Mesh Systems provides a smart service platform to BUNN for their commercial coffee machines. The business challenge BUNN was working to overcome was trying to minimize machine downtime and lower support costs via remote monitoring & predictive maintenance. The smart service platform has enabled BUNN to successfully increase machine uptime, decrease maintenance time and thus, increase the profitability of the machine for the end customer. The game is changing with how we interact with machines. It is becoming cheaper, easier, and more efficient to develop solutions that access and analyze the vast amounts of data coming from every corner of your business, which in turn should be driving actions and business decisions. Gartner predicts that by 2020 there will be over 26 billion connected devices. That’s only 3 years away. Want to learn more about how we can make an IoT solution a reality for your business? Contact us at info@peters.com or 630.832.0075. We are happy to help.